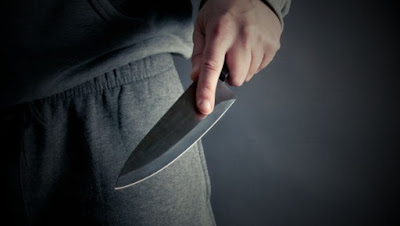 We'll all agree that in order to adopt realistic methods of defence against knife attacks, we first need to understand how an attacker is most likely going to use the weapon. The truth is, we mostly rely on other people (the 'experts') to give us the answers. That's why I decided to properly research on this topic. I wanted to understand the dynamics of real knife attacks and I wanted it to be based on evidence. Luckily, in recent years CCTV and phone footages have provided us with abundance of real-life examples we can learn from. And today I'm going to share with you the results of my investigation where some interesting findings were uncovered. *This a substantial article which took months of painstaking and meticulous work, so I hope you'll enjoy reading it . **No, I'm not trying to sell anything here (no book, no DVD, no online course). It's just a research article made freely available to anyone interested in this topic. So we're left with people who have been "twice attacked" by a knife-wielding nutcase. Although, I'll listen to these people -any experience is worth hearing- two incidents don't make you an expert on a question. Would a major car-maker hire you as a car-safety expert if you just added "Have been twice in a car crash" to your CV/resume? The issue of expertise, with regard to Martial Arts, was addressed in a very discerning way by Wim Demeere in his 2014 article "Are you really an expert?". In the Martial Arts / Self-Defence industry, unfortunately, we too often hear "appeals to self-authority" where the speaker expect you to believe him/her based uniquely on his (often unverifiable) pedigree. In other words, "Trust me, I'm the expert!" One notable example of this type of evidence-based approach is the work of John Correia from Active Self Protection. As of today, Correia has carefully analysed over 175 incidents (robberies, muggings, attacks, etc) caught on camera (see his youtube channel). To a lesser extent (26 incidents), Rener and Ryron Gracie have done the same but with a focus on grappling situations. You'll find the videos (along with the analysis of 62 UFC fights!) on their youtube channel GracieBreakdown. The fact that, during a knife attack, aggressors usually lead with their free hand, while keeping the knife close to their side, was first pointed out in 1988 by Don Pentecost in his contentious book Put'em down, take'em out! knife fighting from Folsom prison. Back in the 80ies, Pentecost simply and brutally shattered a number of popular myths and preconceived ideas about the use of knives in real life situations (see a review of the book on Wim Demeere's blog). As Pentecost also clearly stated, the empty hand is not a dead, "paralyzed", hand and attackers will use it to strike or, more commonly, to grab the victim. This use of the empty hand (also known as 'leveraging arm') greatly changes the dynamic of the fight. Particularly because your first reaction, as a victim, will be conditioned by the movement of the aggressor's empty hand (more on that in Part 3). But the prime lesson though is that most of what is taught in the Martial Arts and RBSD industry (i.e. attacker leads with the knife, no grabbing, no forward pressure) doesn't apply to the vast majority (70% +) of real life knife attacks. For the same reasons bad guys will use a force multiplier such as a knife -i.e. they don't want a fair fight but an easy prey- they'll make a surprise attack on you from a 'concealed' position or with 'concealed' intentions. And you probably won't see it coming. The aggressor didn't threaten the victim. Instead, he kept his weapon concealed until he struck the woman. Clearly, his intention was not to try to get what he wanted through intimidation/coercion but to eliminate the saleswoman. In 80% of the cases I've analysed, the knife is kept hidden until the very last moment. That is until the attack is launched. Aggressors will try to distract the victim and wait for a good window of opportunity to strike and won't hesitate to attack the victim from the back. Situations with multiple attackers seem less common with only 11.4% of the incidents I've reviewed. Knives are short range weapons, so it doesn't come as a surprise that 70.6% of knife attacks start at conversation range. Such a small 'reactionary gap' means that it's almost impossible to stop the first stab if you're not expecting it. This way of charging a victim, as seen in the video above, is known as a "prison yard rush" (or "prison knife rush"). It was made notorious in the Martial Arts industry by Don Pentecost in 1988. They won't hold back, they won't hesitate. Indeed, the average incident time (i.e. 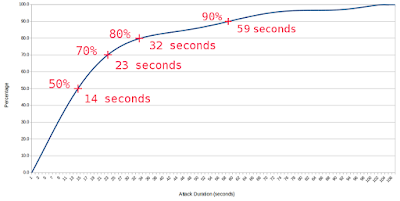 arithmetic mean) for knife attacks, from the moment the attack is launched to the moment it stops, is 23 seconds. It's interesting to note that, although it takes 9 seconds for a 10% increase to 80%, it then takes 27 seconds to complete another 10% and reach 90%. What this means is that if a knife attack lasts 23 seconds, you have a fair bit of chance that it will go on only 9 more seconds. 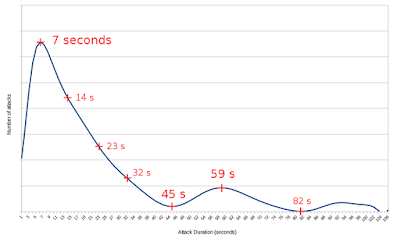 But once a knife attack reaches the 32 seconds mark, the same "fair bit of chance" may requires an extra 27 seconds. 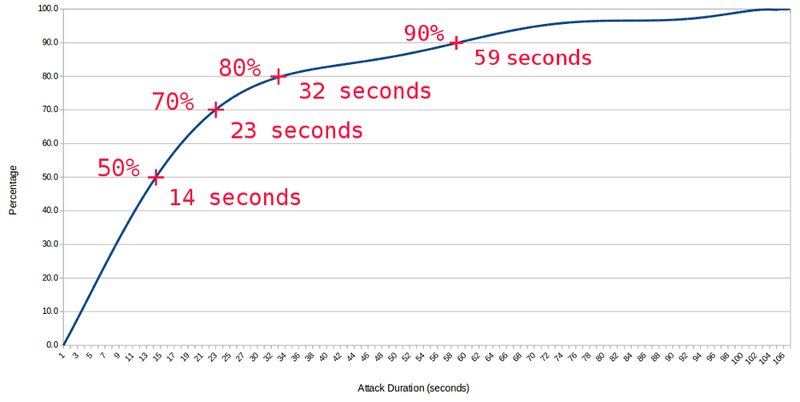 There's a peak in the number of attacks around 7 seconds with 25.2% of all attacks lasting between 5 and 10 seconds, and half of all attacks lasting 14 seconds or less. What the graph shows is that there's a second tipping point around 45 seconds after which a knife attack will tend to go on much longer. Most commonly an extra 14 seconds. 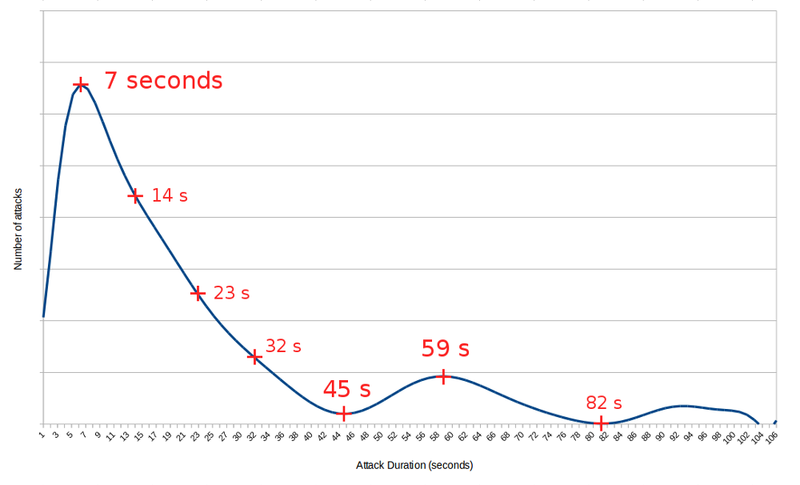 More than half of the "over-45-seconds" attacks last between 53 and 66 seconds. Unsurprisingly, attacks by 'psycho lovers' -who don't care much about being caught- seem to be concentrated in this group as well. Sure, many people have survived a greater number of cuts and stabs. But the unavoidable truth is that you only need one to die! This is an important point because most attacks are not a 'single straight thrust' (i.e. bayonet thrust type of motion) or a 'wide sweeping stroke' (i.e. slash). Also known as the "sewing machine" and "prison shanking", short rapid stabs are very difficult to stop because there is not much time and not much space to 'deflect-and-redirect' the attack or 'block-and-strike'. The majority of attacks are carried out using a regular grip (58.8%) but the reverse grip (also known as "icepick grip") is, at 29.9%, more frequent than commonly thought. It's worth noting that I've not seen any case of hand-swap (i.e. knife being moved from one hand to the other). In this first part, we've seen that knife attacks are most commonly ambushes, launched at short range (within 3 feet of the victim). They are extremely violent; carried with speed and determination within a very short span of time (i.e. they don't last long). These results should definitely inform our training methods and I will expand on that point in Part 3: "Knife Defence - Empty-hand Techniques". But the nagging question at this point is "how do people survive knife attacks then?" You're right, no holy grail unfortunately. The only thing that can be done it to mitigate the risks . Or, to put it differently, limit damage but avoiding a number of mistakes. PAtrice, really excellent article. Many thanks. I struggle with this issue looking at UKM ,IKMF, Senshido, Fight, Jim Wagner, TargetFocused. etc...this evidence based work reminds me of Fight like a Physicist..good work certainly explore in drills. A month ago I was attacked and stabbed for the SECOND TIME by the same stranger, and everything described here fits exactly. Rapid, totally unexpected, cornered, subdued, frenzied. The first one lasted 10 seconds, until his knife broke (in my head)after 4-5 stabs, resulting in life threatening blood loss and permanent facial nerve damage. The second time, nearly a year later, he had a screwdriver, which was much less effective. . .but 37 stabs in about 30 seconds. Horrifying, mind-boggling, incomprehensible. And he roams free. @J Murray, thanks. No one seems to have THE answer. Perhaps it's because there's not ONE answer and we need an arsenal of techniques to be able to cope with such attacks. Sorry to hear about your ordeal. That's terrible. I wish you a good and quick recovery and I hope justice will be served at some point. Thanks for taking the time to talk about your experience. Great article sir, and I really appreciate the time you must have taken to put it together. I always use CCTV videos and compare it to the training that is available. In most classes, "Grab and Stab" is not practiced. Nor is being attacked from different angles. Also, there is a disproportionate amount of time spent doing knife v knife training - as pointed out in your article. Where it is knife v empty-hands, it's usually an instructor showing off with a training knife (in full view before the first cut). Little emphasis is given to making space and running, or dealing with knife wounds - despite the oft repeated adage "Expect to get cut". Thanks again for your article and the great info / videos within! Great article of yours; Thanks for drawing my attention to it. Very well written and insightful. The Teuller, "21 feet" rule, rule is just and approximation. Different people have different reflexes, speeds, ability to accesses weapons, etc. I would NOT rely on that rule as an absolute for gun, knife, club, whatever. And I say this being in Texas, were lots of us folks have CCWs and IDPA/IPSC is popular. But I do say, your advice on this page is excellent. That's correct. The "21 ft rule" as it's known is more a guideline. I wouldn't rely on that either but it's useful in that it helps people to understand the concept of "reactionary gap" and that they should integrate these parameters into their training. Sorry to hear about that terrible experience. Thanks for sharing. I'll get in touch on FB. Extremely sorry to hear about your traumatic experience. Many are on your side including me. Thanks for this. Knife attacks sound bloody terrifying. Do you see any methodological flaws your dataset could have ? At first I would have assumed that Youtube would be biased towards CCTVs footage but your sample seems surprinsingly varied. Have you though asking your local police department for similar informations ? > They're usually launched in a semi-closed environment, within 3 feet of the victim who is cornered. This seems reasonnable, but I assume this conclusion stems from your dataset of video. Perhaps you could make your case even stronger by looking at various governmental statistics website ? I wouldn't be surprised if there was some informations that would be coherent with your statement. You could try the UK [ https://www.gov.uk/government/statistics ], and US [ https://www.usa.gov/statistics ] , Eurostat [ http://ec.europa.eu/eurostat ] and puisque vous êtes francophone l'INSEE [ https://www.insee.fr/fr/accueil ], l'OFS [ https://www.bfs.admin.ch/bfs/fr/home.html ], et iln'yapasdejoliaccronymechezlesBelges [ http://economie.fgov.be/fr/statistiques/chiffres/ ] devrait avoir quelque chose à vous dire. I'm not sure the police in the UK would release much information, but that's worth exploring. I'll have a look at the links but from experience official data rarely provide of level of detail needed. It's hard to find a perfect data set but the prevalence of CCTV cameras in many (and more) places along with the number of phone footages result in a good sample which is also supported by the variety you mentioned. It's true, though, that surveillance cameras being mostly in shops and shops being a places that are targets for robbers, the "semi-closed" factor is probably amplified. But, from a number of footages, it also seems that semi-close environment confers good tactical advantages to an aggressor. So we may not be that far off in terms of representativity. Of course we're missing data from domestic contexts. Here, information provided by the police helps a bit as it appears that reverse ("icepick") grip is most most common. But that doesn't make a bit difference with regard to the way you're going to defend the attack. In any case, the most objective information we can get are these videos. One of the best articles on knife defense i have read! Thanks. what are the others? Thanks for the kudos and the link. Great article. I appreciate the let the data (video of real knife usage) speak for themselves. Thanks. In this day and age, I think it's massively important to put the facts at the forefront. What's your main take away from this article? So true. Here is my biggest take away. Ever since I read Don's book over 20 years ago, this is how I taught my students to use a knife. I did not realize that it was so common in the real world. I have seen many of the same videos you reviewed so knew it was used but to see 70% of the time was an eye opener for my weapon defense training. I utilize a combination of footwork, parries/blocks and evasive body movements to get out of the knife path followed by arm monitor provided it does not significantly delay my strikes. I am not a fan of submissions or control movements to stop a knife attacker nor someone being able to take their weapon away (disarm). You need to launch power strikes that shock him. It seems there will always be discussions around the technical aspects but I suspect that, more than the technique, what makes the most difference is speed of reaction and focused violent intent. So, knowing the situation well enough to understand the dynamic and realising what's happening is critical which is why I presented the article this way. Do you have videos of your work? Chaos and surprise! I like to replace knives by markers to see the amount of damage. Just a great article. I was for years saying "there are a lot of real world fighting videos out there now, unlike twenty years ago we can just go look at them." You did it as a study and survey. You debunk respectfully so much nonsense. Many thanks. RM in Massachusetts. As you rightly point, lots of data is now freely available and time was long due to take our industry beyond the all too common "personal opinion" quarrels. I also believe that for the sake of everybody, egos should be kept in check. Respectful, evidence-based discussions can be very constructive. I was also stabbed by a family member 15 times a few years ago. How it physically feels to be stabbed: it feels like being hit with a really hard, really precise punch. Fine motor skills definitely disappear, as you mentioned. Using my left arm as a shield probably saved my life. The arm was messed up, but you can live without an arm. Sorry you had to experience that and thank you for sharing here. What stopped the assault in the end? Third party intervention? Did you manage to escape? Have you fully recovered the use of your arm? Thanks for the reply. Yes, third party intervention ended the assault. And yes, after multiple surgeries the arm is almost as good as before. Thanks for compiling this article. It's a fantastic study. I hope a lot of martial arts and law enforcement people will use it. Glad to hear your arm recovered. Mu hope is that, following this article, people in the industry are going move beyond "opinions dueling" and towards evidence-based research. What tactic adjustments would be feasible in consideration of age and gender? Considering how bad knife attacks are, I don't think there is any tactical adjustment to be made based on age or gender. Against a knife, everybody is weaker and in grave danger of being killed. So everything (awareness, techniques, principles, etc) applies the same for everybody. Whether you're male or female, young or old, if you get stabbed in the heart or cut on the throat, you die. So, you'll have to do whatever it takes to survive regardless of your gender, age, size, physical abilities. The possible adjustments are on a personal level. That is, what you can personally do or not. This understanding is gained through training, and more particularly "pressure testing". Great article. It opened my eyes and made me reconsider all I've been taught. Every serious martial art should study these concepts at length. Thanks, glad it had a positive impact on your approach to these issues. Are you familiar with Tim Larkin and his Target Focus Training? Whether empty hand, impact weapon, knife or gun, they teach you to cause injury in the other guy, period. Real injuries to the body such as strikes to the eyes, throat or neck, groin, solar plexus, collar bone, ear cupping, breaking an ankle, etc., will put the real weapon, the person's brain, out of commission. They say yes, you may be hit, cut or shot, but if you get a good injury, you will win. Stop focusing on the tool and put the weapon (the person's brain) out of commission. Something to think about anyway. I haven't trained in TFT method but I'm aware of Tim Larkin and his system. I'm on the same line as I think it's more important to develop skills than to have a collection of techniques. As they say "you're whether at the table or on the menu"
I appreciate the effort and time you put into researching this issue. The fact that you reviewed so many videos, source your material and identify what if any issues you have with the technique being shown speaks to your dedication and thoughtfulness. As someone in the US who carries a gun every single day the belt technique wouldn't work for me. So I'm left with the empty handed skills portion. Thank you for providing such insightful material. This is perhaps the best article on self-defence against knives I have ever read. Kudos! I have training in JKD and Kali under Burton Richardson for more than a decade, and learned through regular sparring that empty hand vs. knife is just a terrible situation to be in. Below is a short clip of Burton demonstrating a disarming technique. I welcome your thoughts and criticisms. Burt Richardson is a name I could have included in the article as his work is well known and respected. Regarding the technique in the video, I would prefer to be closer to the aggressor with a stronger grip on his arm (you're stronger when you maintain something closer to your chest than at arm length). This would also allow me to use my head and eventually my knees to strike the aggressor while maintaining a firm control. More leverage on the arm too. This being said, empty hand against a knife is one of the worst situation ever, so 2 hands on the wrist is better than only 1, and 1 hand is better than no control at all. As I say in the article, you need to be able to adapt to a variety of situations. What if I totally mess up my move and end up with only one hand on my aggressor's wrist? How do I recover from that and improve my position? Great breakdown of material. I have trained in FMA for a while, and can see the points you are making and how it relates to training. Still with the tendency to focus on trapping the attacking arm; I still believe this would be tough for a person of small stature to achieve. Can't offer any solutions, need to take this material back and experiment. Everyone should be focusing on multiple talents, everything from situation awareness, pre-attack signals/behaviors, through self defense, post-incident response and first aid. One thing to add; identifying specific skills that could improve your survival, then developing drills that can instill that skill/reaction. One example that comes to mind is trapping (pick your poison JKD, FMA or Wing Chun) in the development of hand speed/reaction. Great work, thank you for taking the time to put this together. I'm totally with you on this. Multiple talents/skills including post-incident response and first aid. I always encourage my students to cross train and try other styles to develop or improve their skills. I believe that's the essence of learning various systems/styles. It's not about creating a collection of techniques but about developing skills. If I were an employee in a high risk crime area it might make sense to wear certain items that can degrade a knife attack. Usually they are made of a Kevlar material for the throat or forearms. Others options include abdomen protection. They are not obvious but might make the difference between survival or crippling wounds / death. Searches on Amazon will reveal various anti-blade items that are not terribly expensive and still allow an employee to function normally. IIRC, back in the late 80's, some felons recommended thick bound copies of National Geographic magazine under the shirt to protect the kidneys. And as Pentecost also wrote: "in a life-threatening situation, get whatever you can, when you can, as many times as you can!" Looks like it is very hard to even know that you are being stabbed let alone try and fight with a disadvantage. Seems to me that armor is the best if you can wear it all the time, passive protection. It would be nice to have a shield as well but you cant carry one around and ,like a gun, wont work if the attacker is on top of you before you know it. Yes, that's what most victims report. Not knowing they had been stabbed. In that regard, one commentator here said "How it physically feels to be stabbed: it feels like being hit with a really hard, really precise punch." Anti-stab vests are not the only grail but that would definitely improve you chances. Absolutely fabulous collection of material. Thank you sir. I look forward to more. Patrice - thank you so much for this. What I appreciate the most is your evidence-based reality-focused approach. You've opened up the conversation for experts to start engaging together and create workable solutions. I am grateful for the time and effort you put into this. Article has good and bad stuff in it. Good is that you analize many real situations, bring statistics so we can see what is most likely scenario, tell on what we need do pay atention, what are options and some Stuart technique (going behind opponent's back) and some different aproach from common. Bad is technique especially in part 3, you say that you put some video's for us to see grip or arm position you prefered and that's ok, but technique people show up is not real. In some cases defender see the knife, in real attack most likely not. There is no surprise element in any of gym attack, also according to you and I agree with it, is big part of potential defence. Not mentioned in the article, but I saw many people practice to defend with knife from knife attack. Yes is good if you have that skill, but what are the chances for civilian to have knife close to himself when attack with knife occurred, if we exclude kitchen fights :D . People who have weapons most of the day (police, military, security officers ...) should train to use them, others no because in attack situations there are no weapons in his arms, so it just waste of time to train knife ws knife. Instead, we should train how to be awere stuff around us and what we can use if attack occurs, it could be stick, bottle, belt and bagpack as you said and many more things. To end with great stuff of the article. Weapon part is something that in my opinion is need to focus on and develop skill for recognize potential one around us and use them for defence. Also, great is that someone invested time to see and collect all the videos, experience to separate useful one and share with the world this article, so we can discuss and make some progress on field of defence from knife attack. Thank you for taking the time to leave a comment and being part of the discussion. Fair point regarding the techniques. I guess we'll always be frustrated with this technical videos which have to conciliate clear explanations and realism. Not the easiest thing. I could have gone to the extent of just including videos of me focusing on the techniques I consider the best with regard to the situations at hand. Quite like what I've done with Stewart and David. But I also felt it was important to show and acknowledge the work of other people (however imperfect their videos or techniques were!). (i) credit should be given where it's due. A large part of our knowledge and work is often the sum of a number of other people's work and knowledge. This has to be honestly recognised. (ii) Similarly, solutions are found because we share knowledge and experiences. We confront points of view and ideas. Therefore, it's important to open up the conversation and engage with fellow "martial artists". (iii) I wanted people (the readers) to get a sense of the variety of techniques and approaches. And I wanted people to see for themselves and make their own mind. Very well written article. Some of the best information I've seen regarding knife defense. So many people continue to believe "I'll just shoot the guy", and then we put them in a real time situation. Eye opener. Yes, best advice is avoid and run away. But, practice with as many people as you can to get a feel for different situations. Big, small, fast, strong, as many touches you can make helps the motor skills. Be prepared and hope you never have to use it. Great job. Good points re. the importance of training with a variety of people! Well written and excellent research in this article. I have a question regarding a comment, you say you don't think the classic krav maga 360 defence wouldn't work in a scenario, could you possibly expand on why you don't believe it would? I know it's not a perfect solution, but the principle of blocking while striking the attacker seems a sound solution. It's simplicity helps as no fine motor skills are required in a high stress situation. The first is that I mentioned this point in the context of the "free hand" lead scenario which is the most common. The best way to understand my point is to recreate the scenario: ask someone to grab you by the lapel, then push you backward as hard as they can, arm extended, while stabbing you with a training knife. From a neurological perspective, the fact is that our brain can't multi-task. That is, it can't actively do two things simultaneously. What's happening when we do what we call multi-tasking, is that in fact we are shifting our attention sequentially; not doing two things simultaneously. That is, our attention will go from one thing to the other alternatively. Really, we're juggling tasks. But for a number of other tasks it can't work because attention can't be divided. You need to have your full attention on only one thing. Particularly when things go very fast. Ask a baseball player where his attention is when he's in the batter box and the pitcher is winding up. He'll tell you that all his focus is on the ball. Ask a tennis player where his attention is when his opponent is releasing the ball to serve. He'll tell you that all his focus is on the ball. Ask a goalie the same question and you'll get the same answer. Over and over again across all sports. That's also why so many countries have made illegal to use a hand-held phone or similar device while driving. "Multitasking" doesn’t just slow you down and increase the number of mistakes you make; it temporarily changes the way your brain works. Similarly, when someone attack you with a knife at full speed, you can't divide or shift your attention between (i) blocking the blade and (ii) precisely and properly punching the aggressor in the face. You need your full attention on blocking the blade, because if you mess it up you're dead! My name is Hank Hayes I'm the CEO of NLB Tactical and No Lie Blades. The author of this article was nice enough to mention (quote) our work a few time. Thank you. We provide tactical combative training for the Military and Law Enforcement communities offering edged weapons, impact weapons and firearms training mainly to the special teams communities. I though the article was well written and covered a wide variety of important items and did a good job at that! Edged weapons skills is a very sensitive topic subject filled with trainers that don't know what their talking about and instructing bad training. We've been able to remove the guess work by inventing the marking feedback training knife. It provides immediate, accurate real-time feedback letting everybody on the training deck know whats fight strategies are working and which are not. I have found that very few people can speak intelligently when it comes to the truth in knife combative. This article has achieved that goal. Please seek out our company's services as we are the only United States GSA contract provide that has this training technology and accountability training platform. Excellent article, great information. I was attacked with a knife in the Philippines back in the '60s. It was a robbery attempt, and in reality, the guys intent was to get my watch an wallet, not my life. (Thank goodness.) I used the belt technique.. flipped it just like the old locker room towel snap, and when the buckle hit him over the right eye, it was over. He took off to find a more compliant victim. Had he intended to kill me, I'd likely not be sitting here writing this. Thanks for leaving a comment and sharing your story. Good reaction though. I truly believe that the belt technique would work with most mugging attempts. No one is too keen on being slashed in the face by a belt buckle. Thanks for the heads-up. Is that an updated version? No it is not, just a different publisher and cover art etc. What is your opinion of this? I currently have no training, only an idea of what I might try, if ever in a knife attack. (something I hope to fix) AFTER attempting to escape, I would try one of two things, based on if I am carrying. I just recently got a Conceal Carry License, but do not carry yet (training first). Plan 1, if I were carrying, would be to escape or put enough distance, to draw and fire. If the attacker was too close, or got close after I started to draw, I would sit/roll to my back, and use my feet to keep him at bay long enough to fire. this idea comes from seeing training of LEOs who fire from lying on their back, and also the evidence that I may end up on my back from the attacker's momentum and trying to escape. I also think that my protected feet would be best way to keep him away from my head and organs. Again, if escape failed, or he was on me with no chance to draw. Plan 2, if I was not carrying, would be to grab the knife arm, as discussed above, and roll backwards, using his momentum to flip him over me. In a perfect world, he would hit his head on something, or otherwise suffer damage. If not, then hopefully I would be quick to my feet, and flee. This seems good to me, since grabbing and flipping him seems way less dangerous to me, than grappling, or trying to reverse his momentum and push back. Again, I have no fighting skills/training, so the Judo like move, and fleeing, seem good to me. In many of the videos shown above, the attacker is blocking the only exit, by his design. So, I also think this type of move would get me on the "exit side" of the area. do these have any deadly flaws/consequences, in your opinion? Theoretically, rolling on your back with your legs towards the aggressor would indeed give you (relative) protection and time to draw your weapon and fire. This being said you need to be sure you'll be able to draw your firearm because once you're on the ground -struggling to deploy your firearm- you're in a very bad position (little protection, no mobility, etc). I personally would still try to stay on my feet (you move faster on your feet) and create space laterally. As for Plan 2, I would advise against going to the ground intentionally. Particularly if you put yourself in bottom position. As a general rule for self-defence, don't put yourself at a disadvantage with the idea that you're going to pull off that amazing technique which will turn the table. It rarely works as intended and if you mess it up, well, you're dead! I've train a lot with people who had background in judo and BJJ and they tend to try to take the fight to the ground and pull you in their guard and in my experience it doesn't work well in the context of self-defence simply because I can do a number of things that are forbidden in these sports (like punching) so it changes the dynamic of the fight. If you're taken to the ground and there's no coming back, in that case sure, you can try to flip him over. Otherwise, I'd try to stay up. The best way to figure this out is by pressure testing during training. Try it and see how it works for you. If we don't know there's a knife involved why are we practicing different techniques for knives than for empty hands? What would you do if a guy ran at you with his lead hand attempting to drive you backwards and was punching you with his right? Personally, I'd throw an overhand right and knock him out because the fastest way to win altercations is to hit the other guy as hard and as fast as you can...and that works whether he's unarmed, tooled up or has friends with him. Ergo...spend most of your time working on really hard fast accurate striking techniques - predominantly with your hands - and that will give you the greatest chance of survival. PS: Not a huge fan of the prison study because in prison their weapons are improvised and usually only capable of stabbing, therefore they don't deal with any type of slashing attack like we say on the planes on 9/11 with the box cutters they deployed. PPS: Good work doing the research and attempting to tackle what is a tough subject. We could also take the problem the other way around. If we do know whether a knife is involved or not, maybe we should act with the assumption that a weapon is in play. The only reason we would work on specific knife defence techniques is to develop specific skills. But, then, everything has to be bound together (pressure testing is a good thing for that). I totally agree with your comment - if you do not know they have a knife then your defense should assume it which means everything needs to be synced up. Totally agree on the importance of power strikes. Very well researched, thank you Patrice!BTW have you watched the wonderful Jim Carey sketch on knife defence on youtube? Great lesson in how not to teach! Yes, I know that Jim Carey sketch. Hilarious! Thank you very much for this great article. I was doing a lot of research and training on knife defense. If the attacker leads with the knife than marc danny shows on his great DVd´s " die less often" a good solution. I mean the best solution I have seen so far. If you don`t see the knife, i think it is always the best to work on a strong simultaniosly conterattack like Tim Larkin or Wing Chun. Do you have any reference for Marc Danny's work? If both arms are used to deflect the knife, the head is free for counterattack. Use it. Awareness is key... good article. Unless you are a military personnel or someone training with knife attacks consistently, chances are you will get cut and killed. It is best to carry a good brand of pepper spray or a stun mechanism and keep it ready. Along with awareness you can survive a knife situation. A gun is totally a different story. Thanks for dropping a comment. A weapon could help indeed but deployment remains an issue. Pepper spray is a very contentious one as the effects are not necessarily immediate. The first step is to do research--which you have done some work on. You forgot to look at the Dog Brothers and you obviously forgot my work from 1995 (more on that later). The salient area that you neglected to research that is crucial is the blade LENGTH: that determines how you will be attacked and what sort of unarmed answer you will have. I might also draw your attention to the fact that I put out a knife defense tape in 1995 that used real knives that were sharp at real speeds--the "gurus" in the knife fighting industry called me irresponsible. Really? They are charlatans--you cannot learn how to land a jet if you do not practice landing a real jet--markers, rubber knives compliance are all thins that are not ISOMORPHIC. We have always used this powerful technology as have NASA and militaries around the World. Many thanks for taking the time to comment here. The main objective of this research was to see what actually happens in real life (not among trained people which it's quite different) which is why I started with the analysis of CCTV and phone footages of real life situations. Then, I tried to see what where the potential solutions to these situations. As far as I can tell from the study of CCTV videos, blade size doesn't make any difference in the way people are attacked in real life (except, of course, when it's a machete). This being said, I'm sure FMA people have a lot of interesting things to say about these aspects but it was beyond the scope of this article. Do you have any link to your 1995 knife defence? I've been threatened with a knife twice: Once in Amsterdam, a guy wanted to sell me drugs and wouldn't take "no" for an answer (kind of deranged). Fortunately, he didn't have the knife ready and sort of turned to get it out. I noticed, we were a little hemmed in so I quickly said "OK, I'll buy", which distracted him and then I employed the sudden "run away" move which worked. The second time was in Old Jerusalem in an alley -- I saw the knife he was sort of concealing and something paranoid in me that day made me think about routes of escape. Again, to distract, I yelled "get him!" and then ran, I remembered seeing a stair case nearby to the roof level (which was open and you could run anywhere) and run up there where I could openly run. If you can (situational awareness), running is a great defense. I'll also say: in both situation, my brain was raising hairs on other cues that I wasn't consciously aware of, but listening to your brain is good advice. Thanks for sharing your experiences. Glad you were able to escape unharmed. Hi, your article is the best one I have read with regards to knife defense. In fact, you should make it into a mini booklet for sale. To me, knife defense is the most important aspect of self defense. The reasons being it is a weapon that is easily available and be improvised as well (screwdriver, ice pick, broken bottle, etc). It is silent and allows the assailant to stab several people in a crowded place without being detected till it is too late. Unlike a gun, you need no technical skills to kill with it, just need pure bad intent. Hence, I actually evaluate whether a self defense system is worthy by looking at their knife defenses. If the concepts and approaches are unrealistic, everything else is a joke and complete waste of time. When dealing with a knife, personally, I recommend the "Dog Catcher", a cross block done vertically to block both high line and low line stabs, as taught by the Dog Brothers (see their dvd - Die Less Often Vol. 1). The Dog Catcher is zone blocking which works well when you have no idea (since it's an ambush most of the time) the next stab is going to be a high (chest and above) or low line (midsection or below) attack. I will then attack the head (especially the eyes) and groin. Most importantly the throat (in Asia where I come from, many robbers come on bikes and they will rob with their crash helmet on, so that you can't identify their face later on and also for their protection in case you fight back. As a result striking the head will be useless, thus the only lethal targets left are the throat and sides of the neck). Another option I used is from Lee Morrison, where I will deflect hard the assailant’s leading left hand (push anywhere along the elbow to the shoulder) to my left with both of my hands, assuming his knife is in his right hand, to close his centerline as well as to change the direction of his forward pressure. This will bring me slightly behind him and I will slam both hands on the sides of his head to grab it and yank him backwards, following with knee to the back of his head as he goes to the ground. The above are just some of my thoughts on knife defense. Thank you; it's a good idea indeed. I personally like the cross-block too. Your point about going for the throat to avoid punching the helmet is a good one. I don't think I've ever seen that Lee Morrison technique you mention. Do you have a link by any chance? Thanks, I'll update the article. Fantastic and incredibly well-researched article. Really, really well done. Thank you. I would hope this could help somehow. As you say "if even one life is saved". Excellent article, reading it was prompted by the recent knife attacks in London. The UK police now have publicly announced, Run, Hide, Tell when caught in an attack. The advice probably doesn't appeal to the arm chair warriors leaning towards heroics, banking on landing a lucky knock out punch, but what I liked about martial arts training was to lose the ego and study how things, namely bodies and minds, actually work. Your article tackles that well for knife attacks. I don’t know what you think, but if everybody could simply spend a little time each day developing their self awareness, that would help society immensely. The police for instance turned up in 2- 8 minutes, and did an amazing job, but that was 2 to 8 minutes too late for a lot of people. If say doormen and bus drivers, cab drivers, or anyone working in public places were trained simply to fine tune their senses and read body language, it would gain innocent folks some precious extra time in running from or barricading themselves in against the instigators of these cowardly attacks. In general, do you think it is wise, when confronted by a stranger extending an empty hand to you, to default to thinking "they have a weapon in the other hand." This would cut out the time or stress trying to see what they are holding, with little downside to making the wrong assumption. I think the police advice is the most sensible. Certainly not appealing to would be super-heroes. Ego is what gets you killed, indeed. Increased situational awareness would certainly help but you can't stay switched on all the time (see my other article on this). Doormen are quite good at reading body language but these situations are rare (thank god) and develop very quickly, so it's hard to have the right reaction. My take is that, in these situations, a bit of training to improve the initial reaction would make a big difference. This leads to your last question. Making assumptions is very risky but in certain situations, well, you have to assume they have a weapon. It's all about the specific circumstances. That's where you need to be able to read the cues, particularly non-verbal such as body language. Well researched. Valid points. Useful insight. A great addition to the study of the blade. Thank you for this valuable contribution to the study. I found your website when looking up information and ideas about protection from knife attacks following the recent terrorist incident in London (I live in the UK). In the terrorist attack which occurred a fortnight ago all 3 terrorists had bound their knives to their hands, so disarming them would have been impossible, it was a case of stopping them, incapacitating them, or they will continue to rampage like a wild, flailing machine. How would someone defend against that, bearing in mind in the UK we're not allowed to carry weapons (unlike the terrorists)? I can see there's some 'protection' techniques, such as putting things such as furniture etc inbetween you and them, but takedown? Worrying times and if I was out with my family I'd like to feel I was primed with a pre-emptive idea or two to keep us safe. Disarming has always been an issue that very few instructors acknowledge. The use of stanleys (cutters) and more recently of ring knives make disarming a risky affair. If you can't disarm them, you'll have to break their arm. Ideally, you'll try to use a force multiplier (weapon of fortune) such as a stick, pipe, chair, backpack, etc, but attacks unfold very quickly and it's not always possible to deploy a weapon (even if you're sitting on it). An important point is that, as we've seen in the London attack, the time constraint the attackers operate under led them to move on very quickly to another victim when people resisted (throwing chairs, glasses, tables, etc). ime is on your side (as long as you haven't been stabbed that is). I'm based in London, don't hesitate to drop me an email and I can send dates of seminars. Thanks for the link. Looks not too realistic on the videos but still very interesting. "Now, what that tipping point seems to indicate is that if you can hold your ground for 7 seconds during an attack, the aggressor is more likely to give up." Is that what the videos show or is that an inference on your part. I could also say, "The 7 second point may actually reflect the point at which most attackers achieve their goal -- disabling the victim." Great question! It's a statistical inference. And in some cases, you're right, it represents the point at which the attacker feels he/she has achieved their goal. But, on the other hand, none of them ever check how badly injured is the victim which means that their "enough" point is a matter of perception. And it happens that something triggers that feeling of "job done" at a remarkable point in time. In my understanding, it's the time constraint which was quite evident during the London Bridge attack and on a number of videos from the study collection. Also note that a fair number of attacks are stopped by the intervention of third party. So I believe that if you can stand your ground for about 7 or10 seconds without taking too much punishment, you have more chances to live. Hi. A very informative and truthful article. I used to work as a crime scene examiner and have attended postmortems of knife attack victims many had been stabbed more than 20 times. I also have been doing martial arts for many years. I agree that most martial arts give a very unrealistic idea of a persons ability to deal with a real knife attack. Thank you. The forensic/medical part of knife attacks would be so interesting to explore. I've heard most wounds are on the victim's left side (most attackers are right handed, I suppose) but I'd like to have more statistics about the type of wounds and which ones were lethals. Outstanding article. I'm a Krav Maga instructor and many of these points are covered in our training and curriculum. Esp the time duration of the average knife attack, ambush, angles, etc. All extremely well researched valid points. It is essential to understand these points so you can tailor your drills to keep it as realistic as possible with these points in mind.